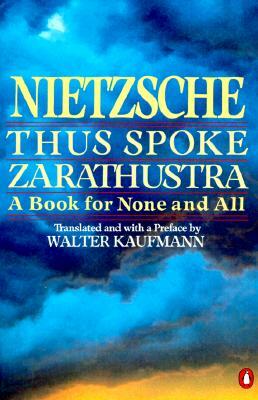 This is my 3rd time reading Thus Spoke Zarathustra by Friederich Nietzsche. The first time I was a wannabee-Nihilist lefty art student in my 20’s and I liked it right away – but didn’t read it all, nor did I read too carefully. The second time I read T.S.Z. was about 4 years later. That time I read it as it deserves to be read: in a cave in a desert canyon with nearby views across vast arid zones, after hitch-hiking the western U.S. for many months alone. And I LOVE IT MORE THAN EVER !!!!! PS: I think Kaufmann translation is the best. Why does he not come who has so long announced himself ? ask many. Has solitude swallowed him up? Or are we perhaps supposed to come to him? Now it happens that solitude itself grows weary and breaks, like a tomb that breaks and can no longer hold its dead. Everywhere one sees the resurrected. Now the waves are climbing and climbing around your mountain, 0 Zarathustra. And however high your height may be, many must come up to you: your bark shall not be stranded much longer. And that we who were despairing have now come to your cave and no longer despair – that is but a sign and symbol that those better than we are on their way to you; for this is what is on its way to you: the last remnant of God among men that is, all the men of great longing, of great nausea. of great disgust, all who do not want to live unless they learn to hope again, unless they learn from you, 0 Zarathustra, the great hope. Escape from the bad smell! Escape from the steam of these human sacrifices! The earth is free even now for great souls. There are still many empty seats for the lonesome and the twosome, fanned by the fragrance of silent seas. A free life is still free for great souls. Verily, whoever possesses little is possessed that much less: praised be a little poverty! Only where the state ends, there begins the human being who is not superfluous: there begins the song of necessity, the unique and inimitable tune. Where the state ends — look there, my brothers! Do you not see it, the rainbow and the bridges of the overman? All-too-many are born: for the superfluous the state was invented. Behold, how it lures them, the all-too-many — and how it devours them, chews them, and ruminates! On earth there is nothing greater than I: the ordering finger of God am I — thus roars the monster. And it is not only the long-eared and shortsighted who sink to their knees. Alas, to you too, you great souls, it whispers its dark lies. Alas, it detects the rich hearts which like to squander themselves. Indeed, it detects you too, you vanquishers of the old god. You have grown weary with fighting, and now your weariness still serves the new idol. With heroes and honorable men it would surround itself, the new idol! It likes to bask in the sunshine of good consciences – the cold monster! It will give you everything if you will adore it, this new idol: thus it buys the splendor of your virtues and the look of your proud eyes. It would use you as bait for the all-too-many. Indeed, a hellish artifice was invented there, a horse of death, clattering in the finery of divine honors. Indeed, a dying for many was invented there, which praises itself as life: verily, a great service to all preachers of death! Behold the superfluous! They steal the works of the inventors and the treasures of the sages for themselves; education” they call their theft – and everything turns to sickness and misfortune for them. Behold the superfluous! They are always sick; they vomit their gall and call it a newspaper. They devour each other and cannot even digest themselves. Behold the superfluous! They gather riches and become poorer with them. They want power and first the lever of power, much money-the impotent paupers!